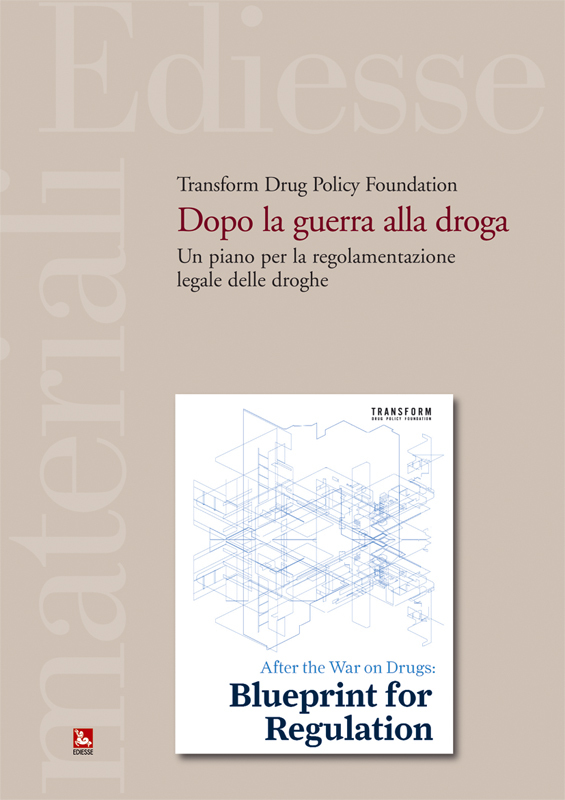 We are pleased to announce that Transform's groundbreaking 2009 book 'After the War on Drugs: Blueprint for Regulation' has recently been re-published in Italian. Translated, redesigned and published in Italy by publishers Ediesse - it is available to buy in hard copy online here (12 euros). The book has a new preface by Sandro Del Fattore and Giuseppe Bortone, and foreword by Franco Corleone and Grazia Zuffa*. We are particularly grateful to Grazia whose hard work made this new edition possible. Transform made the copyright material freely available to the publishers under its existing creative commons licence as they were willing to translate, redesign and publish the book, and crucially make it available as a free pdf as of April 2012. As full Spanish translation of Blueprint will also be published soon. Translations of the executive summary are already available (as pdfs) in Portuguese (also in print), Spanish (also in print), Italian and Russian. The original English version remains available in print or as a free pdf download. *The new Foreword and Introduction are the responsibility of the Italian publishers and authors, not Transform. The book has a dedicated webpage here which includes a downloadable pdf of the full book, and pdfs of each of its four sections. It can also be read online. Steve Rolles, Transform's senior policy analyst, has written a chapter for the book titled 'After the War on Drugs: How Legal Regulation of Production and Trade Would Better Protect Children'. The book also forms part of the new Count the Costs initiative - the introductory chapter, by the book's editor Damon Barrett, titled 'Counting the Costs of the Children’s Drug War'. Please help publicise this brilliant new resource by linking the site, publicising it on your social networks, and drawing attention of key policy makers, professionals and media to the book. The National Association for the Advancement of Coloured People, (the oldest and largest civil rights organisation in the US) has joined the list of prominent organisations and individuals calling for a major paradigm shift away from the failed and punitive "war on drugs" and toward a health-based approach, with a resolution passed last week at the organization's national conference in Los Angeles (see the full press release below). "The NAACP has been on the forefront of the struggle for civil rights and social justice in this country for over a century. The fact that these leaders are joining others like the National Black Police Association in calling for an end to the 'war on drugs' should be a wake up call to those politicians - including and especially President Obama - who still have not come to terms with the devastation that the 'drug war' causes in our society and especially in communities of color." Given that the discriminatory application of the drug laws applies throughout the world, Transform looks forward to black and ethnic minority groups in the UK and beyond calling for reform. (Los Angeles, CA) – Today the NAACP passed a historic resolution calling for an end to the war on drugs. The resolution was voted on by a majority of delegates at the 102nd NAACP Annual Convention in Los Angeles, CA. The overall message of the resolution is captured by its title: A Call to End the War on Drugs, Allocate Funding to Investigate Substance Abuse Treatment, Education, and Opportunities in Communities of Color for A Better Tomorrow. “Studies show that all racial groups abuse drugs at similar rates, but the numbers also show that African Americans, Hispanics and other people of color are stopped, searched, arrested, charged, convicted, and sent to prison for drug-related charges at a much higher rate,” stated Alice Huffman, President of the California State Conference of the NAACP. “This dual system of drug law enforcement that serves to keep African-Americans and other minorities under lock and key and in prison must be exposed and eradicated.